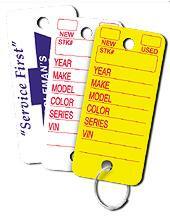 This Poly Tag Key Tag is made of strong 23 mil polyethylene with rounded corners. Key tags are easy to write on. Each box of 250 Poly Tag Key Tags comes with 250 steel rings and a "Fine Point Sharpie" pen.